The Black Sea, captured on May 29, 2017 from NASA’s Aqua satellite using the Moderate Resolution Imaging Spectroradiometer (MODIS). Image credit: Norman Kuring, NASA’s Ocean Biology Processing Group. MIAMI—Scientists are studying the oxygen-deprived waters of the Black Sea to help answer questions about the deepest parts of the ocean and Earth’s climate. “Understanding such processes is especially important today since oxygen in the ocean is decreasing, largely due to the warming of ocean waters driven by climate change,” said the study’s lead author Andrew Margolin, a postdoctoral researcher at the College of William & Mary's Virginia Institute of Marine Science and an alumnus of the UM Rosenstiel School. The oceans have absorbed approximately one third of human-produced CO2 emissions, dampening the effects of carbon dioxide-driven greenhouse warming. One of the pathways for the ocean to naturally sequester carbon from the atmosphere is by storing it in the deep ocean as organic carbon for hundreds—if not thousands—of years. 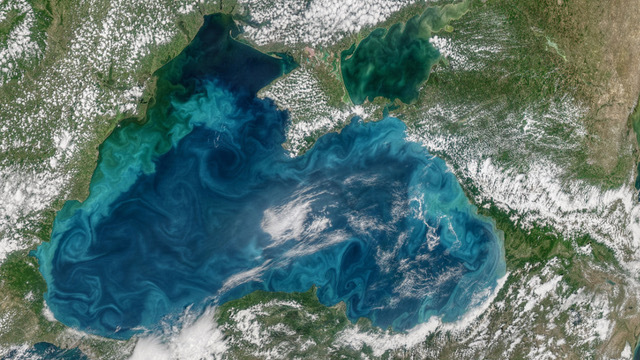 “Insights into oceanic carbon transformations—including the oxygen dependence of organic carbon respiration—can be gained by studying the anoxic Black Sea,” said Margolin.